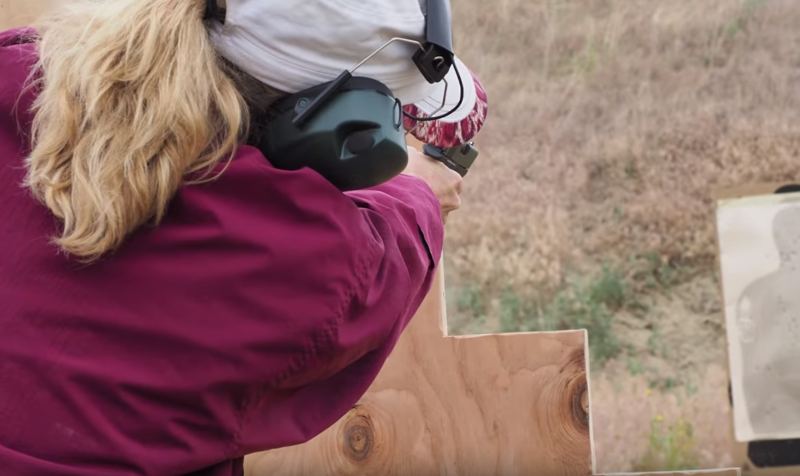 Women are carrying guns for self-protection more now than in any other point in history. While I'm far from able to figure out the exact numbers, one thing remains certain: This country of ours is a mess, crime wise. While the actual crime numbers can be debated, one thing that can't be debated is that there are plenty of idiots out there who feel like they deserve to the point of forceful taking, what innocent people have. This presents a unique problem for women who many times (but certainly not all), have a harder time defending themselves against an overpowering man intent on some kind of harm. And, people are learning more and more that they cannot rely on others to protect them from those idiots. After all, there can only be so many cops out there to serve our communities. You've seen all the memes, right? When seconds count, the police are only minutes away … I carry a gun because a cop is too heavy … God gave me the right to self-defense. GLOCK ensures it. You get the idea. Things are often times funny because they're true. We may chuckle a little bit as we imagine ourselves trying to carry a cop on our back to protect us. But the point, is that more people are waking up to the fact that while police officers serve us and have a job to do, they cannot be there all the time when you need to defend yourself. Therefore, the only thing you can do to defend yourself is carry your own gun. Sadly, many folks make the decision to not carry that gun for one reason or another, and lost their lives. Then again, some people do make that most important decision to take life so seriously that they not only want to protect it with a gun, but also learn how to use that gun. Shannon Ratts is a lady who went through our Guardian Essentials Pistol Course, and understands that. She had two separate incidents where she needed to protect herself, one of which she was unarmed, the second of which her husband was around and able to step in if necessary. Thankfully the first incident she had a dog with her that changed the mind of the guys who approached her. Why did you ultimately make the decision to entrust your life to your own training and gun? Let us know in the comments below. And, if you're interested in the course she took, check out this page. Underlying message is critical, of course….but, this particular one needs some serious editing. Too long, very rambling, boring to the point of tedious. Counterproductive. Sorry for the negative comment, as I am a huge ConcealedCarry proponent/fan, but, I felt this woman gave more reasons why she shouldn’t carry rathet than why shy should. Caroline thank you for your comment and feedback. Perhaps we could/should have edited this down further but the point is to share a real person’s real story. We won’t fix it because the authenticity is more important than the agenda. I agree Caroline! Also your gun is not going to do you any good if you’re out of the car and the Gun is in the car! I had a 38 special Smith and Wesson that was super easy to carry but the trigger was way too heavy on it and it kicked like a mule so I gave it to my daughter. I carry a glock 43 usually or sometimes a glock 19. 1) You need to know how to use it in a defensive situation. 2) You need to know the legal aspects of using (or even showing) a Deadly Weapon (that is the 5 elements of Laws of Self Defense). PS: I have witnessed people at Gun Dealers (one was today, Oct 4 at BUD’S in Sevierville). It is a long story, but so ridiculous to listen to a lady’s idea of her need for a gun and how she would use it. It makes me sick (so to say) to think that people like her could buy a gun (sure she would pass the background check as it requires no knowledge or training in use of a gun), then likely she would pass the CC Permit Class (if like TN’s Class — they give you the answers to the questions then you shoot 50 rounds at a human size upper body target and only have to get 80% in the large area). Nill or No Instruction about the legal requirements for use of Deadly Force (stuff that could put you in prison for a long time up to life IF YOU DO THE WRONG THING). It is time for the 2nd Amendment Folks to also use some sense about regulations. That said, I want to keep my right to own guns, but also have nothing against some sensible requirements for training / knowledge and regulations.